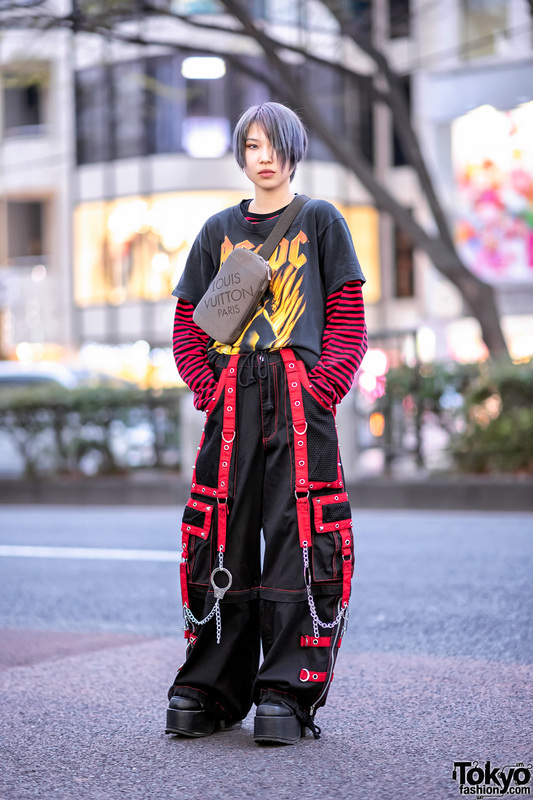 We caught up with DiceK, who stood out on the streets of Harajuku in a striking ensemble with an edge. We recently interviewed Dice-K for our new YouTube series. The 22-year-old Japanese fashion designer behind the brand GlamHate stepped out in a head-turning outfit with pieces from their own line. Their outerwear came in the form of a deconstructed jacket with an upturned collar, a gingham pattern, and dangling silver chain trims. It was worn over a black-and-white striped graphic top, which was tucked into black zip-up pants. The zippers were undone on both sides to expose a bit of skin and black fishnet stockings. They were tucked into pink platform wedge boots from Demonia and worn with white ribbed knee socks. DiceK styled them with a silver embellished belt, a black-and-white checkered sling bag from GlamHate, and fingerless gloves. They completed their look with dark makeup, multiple piercings, and a pink knit “EXIT” beanie from GlamHate with dangling silver chain trims. For more on DiceK, follow them on Instagram and Twitter. Check out the GlamHate’s latest collection on Instagram.